One of these camping catalogs is titled Everything That’s Canvas by Schaefer Tent and Awning Co. The catalog is from 1917. 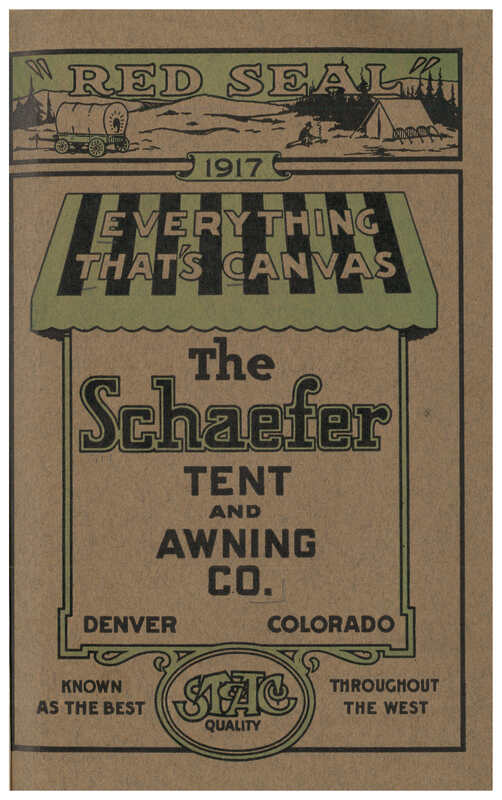 Schaefer Tent and Awning Co., Denver, CO. Everything That’s Canvas, 1917, front cover of catalog. This company sold all types of tents. Shown below is one of their “Red Seal” wall tents suitable for camping. 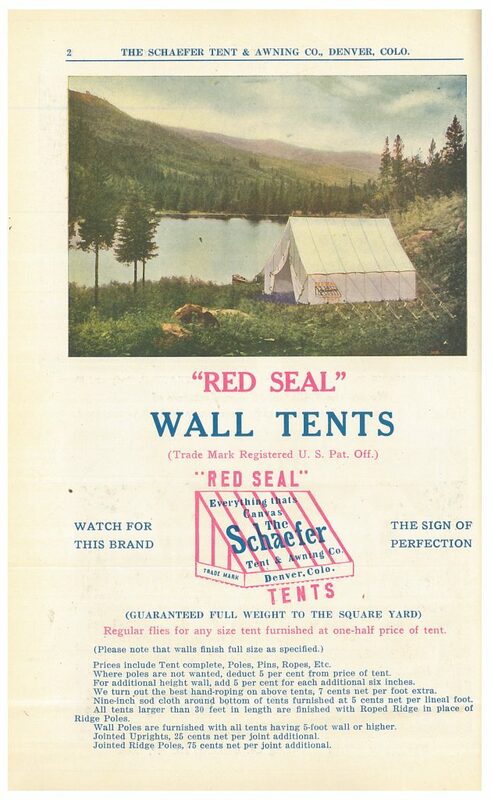 Schaefer Tent and Awning Co., Denver, CO. Everything That’s Canvas, 1917, page 2, “Red Seal” Wall Tent. But some campers might have wanted more than just a tent and sleeping bag. How about something a bit more comfortable? Maybe a mattress or bed? The Schaefer “Auto-Outing” Trailer might have caught their attention. It allowed space to bring not just the tent, but two beds as well. The trailer held the tent with folding tent poles and two mattresses/beds. Once everything was safely stored in the trailer, it could all be covered with a khaki canvas covering and attached to a vehicle with a detachable coupling. In the image on the below left, the car and trailer are ready to set off on a camping trip. The right page below shows how the beds slide in and out of the trailer from either end. As shown in the middle image, the beds are pulled out and ready to be set up in the tent. The tent included ventilating windows and a canvas partition. The partition allowed the option of creating two private sleeping areas. Each sleeping area accommodated a full sized bed and mattress. According to this catalog, the entire camp (tent and beds) could be set up in as little as eight minutes. Schaefer Tent and Awning Co., Denver, CO. Everything That’s Canvas, 1917, pages 6-7, Schaefer “Auto-Outing” Trailer. The company also sold other camping equipment, such as the Patent Folding Sheet Iron Camp Stove. It could be packed away in a carton the size of a suitcase, making it easy to take on the road for a vacation. It also did not take long to set up, just two minutes according to the catalog. Schaefer Tent and Awning Co., Denver, CO. Everything That’s Canvas, 1917, page 51, Patent Folding Sheet Iron Camp Stoves. Everything That’s Canvas by Schaefer Tent and Awning Co. is located in the Trade Literature Collection at the National Museum of American History Library. 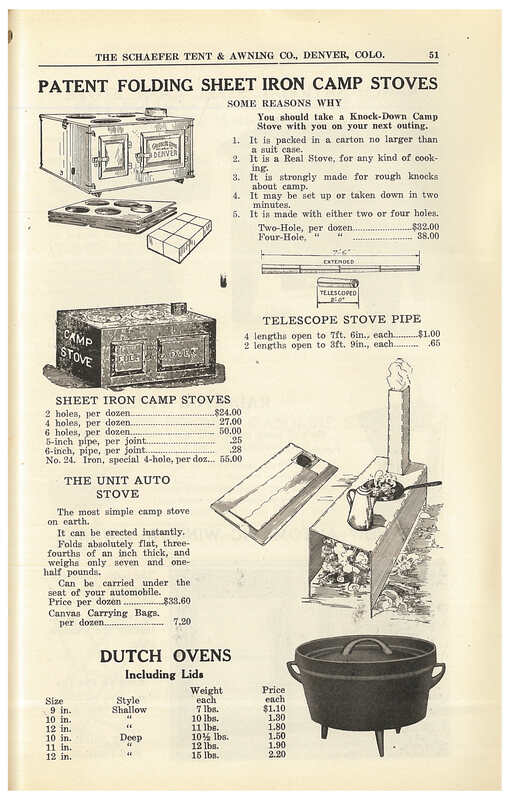 Wondering about other camping trade catalogs in the collection? Check out a previous post about the Burch Combination Bed Sheet, Tent and Sleeping Bag which is a bed sheet that can be transformed into a wedge tent in just two minutes. 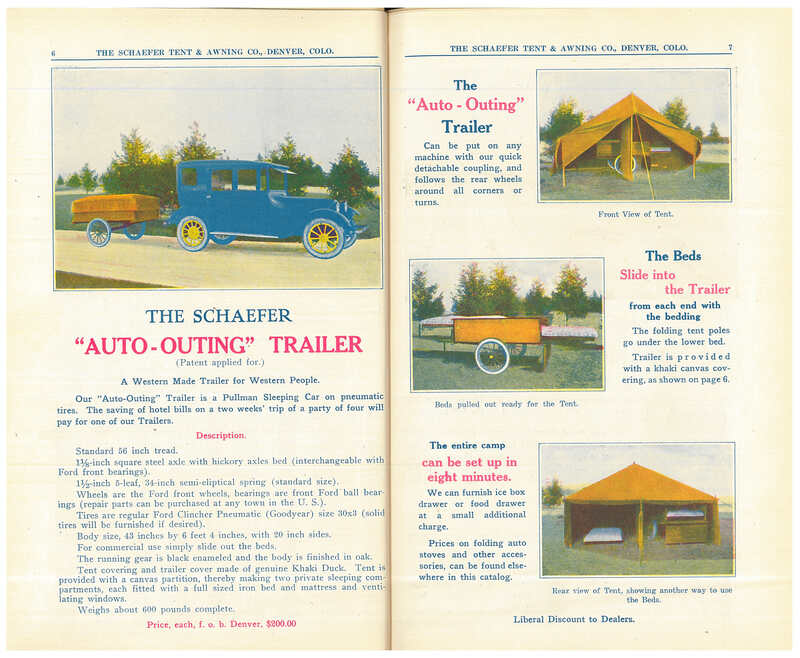 Schaefer Tent and Awning Co.